Did Schumer call Boehner’s bluff on immigration? Update 2/10/2014: A spokesman for House Speaker John Boehner responded to Schumer's idea. "The suggestion is entirely impractical, since it would totally eliminate the President's incentive to enforce immigration law for the remainder of his term," said Michael Steel, Boehner's spokesman. Washington (CNN) – When House Speaker John Boehner abruptly announced Thursday that he didn’t see a way forward on immigration reform this year, he said President Obama was part of the reason. In a bit of a jab at Boehner – and perhaps as a way to force the issue during an election year in which Republicans might like to avoid fighting among themselves over immigration - Sen. Chuck Schumer, D-New York, proposed a workaround. “Now, I think the rap against him that he won't enforce the law (is) false. He's deported more people than any other president,” Schumer continued. However, several other prominent Republicans echoed Boehner’s misgivings about Obama’s commitment to enforcement. Cole said people read too deeply into Boehner’s comments and that, while the political reality is that Republicans disagree among themselves, certain elements of immigration reform could pass the House. Rep. Keith Ellison, a Democrat from Minnesota, said Republicans are the ones failing on the immigration front. "There's no doubt the President was told if he works on the border, the Republican caucus will work with him on passing the bill. He's done his part. They have failed to do their part. And It's obvious the speaker got a lot of pushback from somebody in his caucus who he has to listen to, and so he changed course,“ Ellison said on “This Week.” “I don't think it’s political courage, and I was really disappointed." We need our immigration laws enforced and all illegal aliens deported. 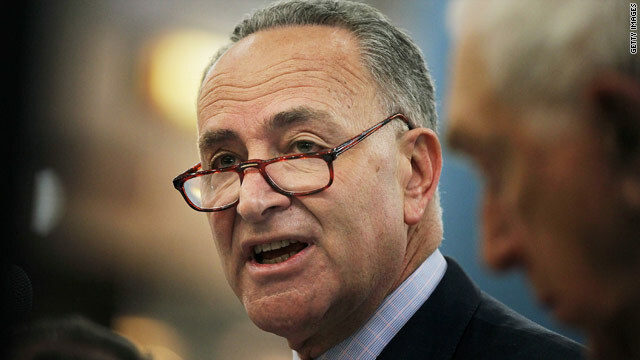 Senator Schumer is a traitor to the United States and wants to grant Amnesty to illegal aliens. He is not working in the best interested of the citizens of the United States but is just pandering to special interest groups. Congress should pass a mandatory E-Verify law that is retro-active and require all employers to fire the illegal aliens that they currently have employed. Lets see if President Obama will enforce this law as a test for any other legislation. Remember this moments GOP. Hispanics will remember it in 2016! Perhaps the GOP should ask the Republican Governors of TX and AZ what they did with the "extra" Federal resources that the Obama administration gave them to prevent illegal border crossings... ??? Inquiring minds want to know! Just more excuses from the Party of NO. The radical wing nuts who support the GOP do not want immigration reform. Every Republican member of Congress is afraid of a primary challenge from the RIGHT. The GOP is suffering from a fatal case of "Liar Liar Pants on Fire", and are having great difficulty finding a non-suicidal position to settle into. The have Lost Big on every issue they drew their Righteous Line on. In a few months, Gays will smoke Pot as they celebrate their weddings with illegal aliens in the wedding party; and we have the GOP to thank. If the GOP had not been such malicious hateful beings and declared war on every front, they might be in defensible shape today. The GOP should have learned from history, and seen that their approach failed the Nazis as well. I guess hate knows no sense of prudence. There they go again! if you want to know what republicans are doing, just listen to what they are accusing Dems of doing. republicans can't be trusted, period. they think it's actually possible to create their own reality and they lie unceasingly to do it. the sad part is so many people believe them. just look at the posts on this site accusing Dems of all the rotten things the republicans are ACTUALLY DOING! how can anyone trust a group who, if their lips are moving, they're lying? This is an election year, It's time for to GOP to leave controlling women's bodies and go back to Jobs, Jobs, Jobs. Nonsense, Why in the world should he GOP do Immigration reform this year when most likely by the end of the year they will controll both houses and could pass a more nuetral middle approach immigration reform. I would never vote for any GOP polititian that gave any form of amnesty, never. If enough people keep buying the GOP/TP and Faux Views line and continue to vote for legislators that only criticize but do nothing but pass their own bills, then the government will stay at a stalemate. Unless that is what people want, they need to vote differently. Democrats are just worried that Republicans will be in charge next year of the senate and house and the imigration bill will not be what Democrats want to see. All of you communist I mean Democratic party liars can pound dirt. Of course we don't trust Obama to uphold the law or the words that come out of his mouth. oh by the way did you know that the welfare dept has emergency medicaid set up for illegals but NOT American Citizens. What?? Do your research! Is that fair? There would be a border stampede that sounded like an earth quake. And Obama would say they're all going to be legalized in 2017 anyway so no reason to deport any of them. They are running away like cockroaches but they can't hide.